Pumpkin is a typical autumn and winter vegetable. Thanks to its unmistakable taste it is an excellent ingredient for sweet and savory recipes. 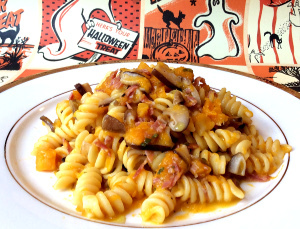 It can be used to prepare many different dishes for Halloween. Originally from the Americas, pumpkins are widely used in Italian cuisine, particularly in the cities of Mantova and Ferrara. Pumpkins are rich in vitamin A and are often recommended in low-calorie diets. 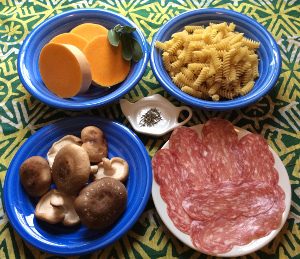 This week’s recipe features pumpkin, mushrooms, and salame, to create a delicious contrast between the sweet notes of the pumpkin and the tangy, salty salami. 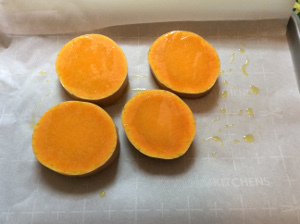 In this recipe, the pumpkin is baked in the oven; this way you will not need to peel it. Also, you can cook extra and store it in the fridge for future preparations like soups and tasty fillings. 1 baking tray, 1 bowl, parchment paper, 1 medium saucepan, 1 nonstick pan, 1 chopping board, 1 knife. Wash the pumpkin but do not peel it. Cut into thick slices and remove seeds. 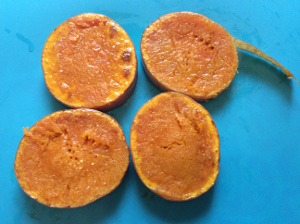 Drizzle pumpkin with olive oil (do not add salt yet). Roast until soft, then season with salt and pepper. Meanwhile, wash mushrooms and chop finely, and chop sage with rosemary. Put garlic and oil in a non-stick pan and heat over medium heat. Add mushroom, sage, and rosemary and sauté for about 5 minutes. 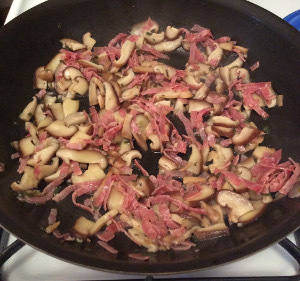 Chop salame into thin slices, add to the mushrooms, and cook for about 2 minutes. 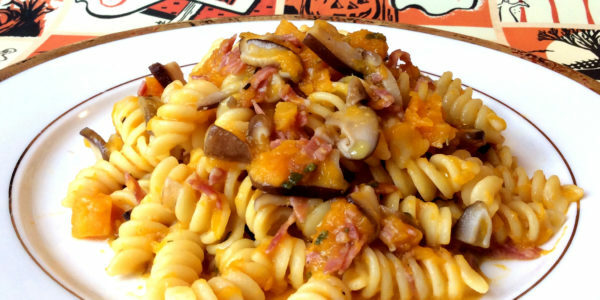 Remove the skin from the pumpkin, chop, and add to the mushrooms and salame sauce. In the meantime, boil a large pot of salted water for your pasta. Cook pasta according to package directions. Reserve some of the pasta water if you would like the sauce to be slightly thinner. 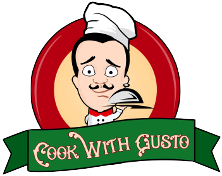 Toss the sauce with the pasta and serve with freshly grated Parmigiano cheese. 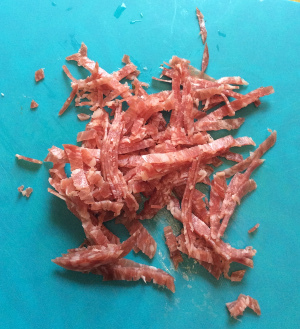 Remember that salame and cheese are both salty, so taste before adding extra salt.